Last month, we charted the evolution of the OASYS, and looked at its sample-based HD1 'High Definition' synth engine. But, impressive though this is, it's far from the be-all and end-all of the instrument. The raison d'être of the OASYS is its ability to host additional synth engines, known collectively as EXpansion instruments, or 'EXis'. So we'll start this month by looking at the first two of these, the AL1 virtual analogue synth and the CX3 organ. The AL1 allows you to 'morph' oscillator waveforms to produce harmonically rich timbres for solos, polyphonic pads and effects. It also offers detuned waves for added depth, and a four-mode ring modulator that allows you to modify the modulator before applying it to the carrier. Moving along the signal path, the filter section offers a cornucopia of goodies, with two resonant, multi-mode filters per voice. The special touch here is an option called 'Multi Filter' that allows you to morph and fade between 22 types of filter profile. It will take me years to plumb all the possibilities here. Not to be out-shone, the amplifier offers Driver and Low Boost controls that make even the simplest patches jump into life. Note, however, that the Driver is very different from placing an overdrive or distortion effect across the output of the AL1, because it affects each voice individually, much like the Hexa-fuzz on Roland's early GR-series guitar synths. In 2001, I was much impressed by the three seven-stage envelopes on the Alesis's A6 Andromeda, because you could see them displayed graphically on the synth's screen, assign them almost anywhere in the synth, and because they offered nine choices of slope for each stage. The OASYS offers five envelopes to the A6's three, five stages to the A6's seven, and 10 selectable slopes instead of nine. The OASYS can thus impersonate the linear and exponential contour characteristics of different vintage synths, and much else besides. Finally, the AL1 is peerless if you want modulation flexibility. Not only does it incorporate four LFOs offering 18 distinct wave shapes, but you can further shape these using nearly 200 variations, and then direct the results to innumerable destinations. Given that every modulator is an AMS Source and an AMS Destination, and that you can apply further shaping and control in the AMS Mixers, the possibilities are almost boundless. Given this praise, it may surprise you to discover that I was not impressed with the AL1's factory patches when I first heard them. With the exception of some superb string ensembles, everything seemed too smooth, too 'programmed', and too drenched in effects. It seemed to me that the AL1 factory set exemplified much that die-hard fans of analogue synthesis dislike about virtual-analogue instruments. But it would seem that there's a reason for this. 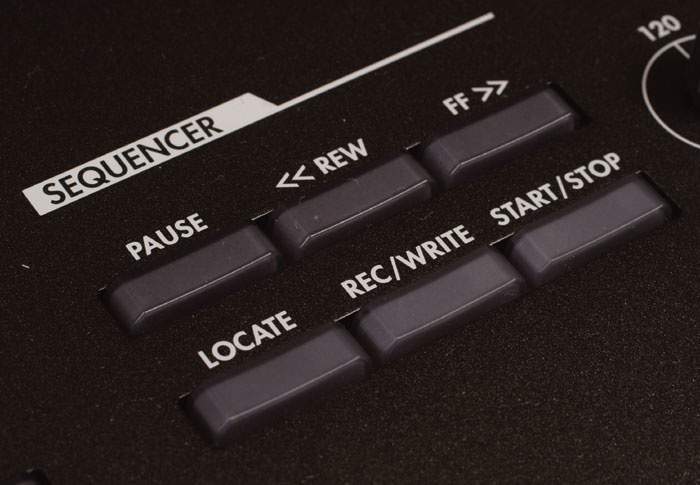 Apparently, when designing the sounds for the HD1 engine, Korg's programmers had created enough sounds to occupy six banks of Programs — but the design team elected to use only five. So the programmers tried to recreate some of their favourite HD1 Programs using the AL1 instead. While this may have been a triumph for them, I don't regard it as a sound commercial decision. As a result of this, it wasn't until I started to program AL1 patches for myself that its true character became apparent. I removed the step sequencing and other tricks, made less use of the 'supersaw'-type waveforms, removed the effects, and went back to square one with the oscillators, filters and amplifiers. The AL1 was transformed. Polyphonic, without drive, it has the same smooth character as some of Roland's vintage polysynths. Wind up the drive, however, and it's like morphing a Jupiter 8 into an Oberheim OBX. Alternatively, punch the Mono, Unison and Detune buttons, and the AL1 becomes a hugely flexible monosynth capable of everything from unassuming single-oscillator sounds to massive concoctions with the depth usually reserved for large modular beasties. Unfortunately, the AL1 won't appeal to knob-twiddlers. Although you can assign all manner of functions to the OASYS's knobs and sliders, the quantisation is too coarse for manual sweeps and bleeps. This implies that, despite the power available, Korg's engineers have neglected to interpolate between controller values. I hope that they rectify this. 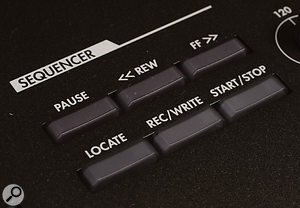 The second EXi is an enhanced version of the generator used in Korg's CX3 and BX3 Hammond impersonators, controlled using the nine top-panel faders as fake drawbars. The enhancements take many forms. For example, the OASYS CX3 overcomes my only significant complaint when I reviewed the 'physical' CX3: that the keyboard gates the leakage noise, leaving an un-Hammond-like silence between notes. On the OASYS, there's a Noise Level parameter that creates a welcome background swirl. I also like the fact that all the Hammond-esque effects (amp modelling, overdrive, chorus/vibrato, and rotary speaker) are contained in the CX3 itself, so you don't need to use up precious Insert Effects to generate them. Furthermore, the OASYS even allows you to create custom chorus/vibrato settings! Mind you, given that the CX3 is designed to emulate the scanner vibrato of the Hammond A100, B3, and C3, this is a little strange, and after a few hours' experimentation, I decided that Hammond had it right in the first place. Nonetheless, it's a boon if you want to fine-tune the effects. In addition to all of this, Korg have extended their unique EX mode, which now allows you to choose the pitches of the four additional drawbars from a list of 73 footages. The range of new sounds obtainable is immense, if not always musical. Oh yes... and you can now use EX mode when playing two 'manuals' either side of a split point. This may sound obvious, but when you invoked EX mode on the CX3, you could play only on a single manual. As you would expect, the sound of the OASYS CX3 is extremely good but, as I write this, I wish that I had a CX3 here to perform a direct comparison. If my memory is not playing tricks, something appears to have changed at the top end... the characteristic 'scream' seems more muted than I remember. Of course, the difference could be in the OASYS's output stages rather than the CX3 algorithm, but either way, I often found myself using EQ in an attempt to add back a certain quality that seemed to be missing. In 1995, the retail price of my Trinity Pro was £2795, and, once upgraded with the later MOSS, HD, and ADAT expansion boards, the price headed scarily in the direction of £4000. The value of the pound has decreased by approximately 30 percent since then, so £4000 in 1995 is equivalent to about £5700 today. In this light, the price of an OASYS doesn't look outrageous, despite what some people have been saying on web forums since the cost was announced. Of course, the public perception of what a pound should buy has changed considerably over the past decade, and many people will view £5000 for a keyboard workstation as unpalatable. If you are one of these, don't worry about it. Korg didn't build the OASYS for you. In principle, the sampler — which is derived from that in the Triton Studio — occupies the free RAM in the OASYS. In other words, if you load the HD1's EXs2 (grand piano) sample set, you should have approximately 200MB for your own samples. If you load EXs1, you should have approximately 400MB, and if you load neither you should have approximately 700MB. But this is not the case; the memory available is a paltry 3MB when EXs2 is loaded. This holds just 34 seconds of samples, which is almost pointless. With EXs1 loaded, the available memory increases to a little under 195MB, and with neither EXs loaded it reaches 500MB. In every case, this is 200MB short of what it should be, which is strange. I have a standard test for reviewing samplers. It's an audio CD with multisamples of various Mellotron voices, with different sounds on each channel, all badly recorded and without topping or tailing. Turning this into a usable Program requires loading, trimming, and keymapping... all of which can take well over an hour on a clunky system. The quickest way to turn these samples into a usable patch is with a software sampler such as NI's Kontakt. Ripping the CD, separating the samples and allocating them to notes is then a doddle, as is the editing. Without a mouse/pointer GUI, operations on the OASYS are inevitably slower than they would be on a PC, although somewhat faster, perhaps, than on many traditional hardware samplers. In particular, once you have created a multisample on the OASYS, you need only click on 'Convert MS to Program' for the whole thing to appear as a conventional Program no different from a factory HD1 Program. Well... no different except for one thing. You may think you have saved everything associated with the Program once you have written it to memory, but you haven't. If you then switch off the OASYS, the samples — if loaded to RAM rather than to disk — disappear in a puff of dispersing electrons. If you don't perform the appropriate Save in the Disk menus, you'll have to start all over again. While editing the samples, I discovered a bug in the system. Select Reverse in the Loop Edit page, and the selected sample does not play backwards; instead, you get a continuous burst of loud, digital hash. Returning to good things, the OASYS answers one of my most fervent desires in any sampler; it loads other manufacturers' multisamples correctly. This may sound obvious, but a quick whizz through back issues of SOS will demonstrate that many samplers are unable to do this. Sticking with the Mellotron theme, I loaded the Akai S1000-format Mellotron Archives CD-ROM and... blimey! 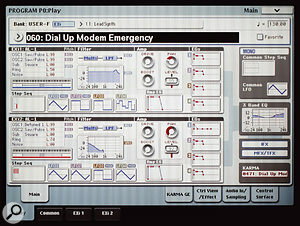 The OASYS loaded multiple Programs of multisamples, stuck them into separate Program locations, and everything worked. Of course, this CD provides an easy test because it has no loops, and minimal filtering and enveloping, but the mere fact that the OASYS handled it so easily is encouraging. In addition to Akai S1000 and S3000 data, the OASYS will load AIFF and WAV files, plus, of course, Korg's own libraries, either from CD or via USB. To those of us who have piles of Zip drives and clunky old 500MB HDDs lying around, the OASYS is less kind; it does not have a SCSI interface. It also won't load Roland sample libraries, although I hear that Korg have it 'on the list' for inclusion later. In addition to sampling, the OASYS permits resampling of its output. This is a boon when you want to lay stems back as a single audio file, and also allows you to resample complex audio, chop it up, create loops, apply wave sequencing and KARMA (both of which I'll discuss later) and generally mould sounds into new shapes. If you're into experimental audio techniques or the modern equivalent of musique concrète, this is just the job. The Help button takes you into a context-sensitive Help system. This is hugely cut down from the paper manual and parameter guide, but is comprehensive enough to guide you through much of the OASYS, and is invaluable when you don't have the manuals to hand. I hope that Korg continue to work on this, improving the indexing and expanding the content, because it's an excellent facility that deserves further development. I always found it strange that Korg workstations offered Combis that incorporated up to eight Programs, but also provided a single Sequencer setup that included up to 16. Happily, the OASYS dispenses with the eight-part limitation, and its Combis now boast the full complement of 16 Programs. They also offer a great deal of real-time control over the sounds generated by the Programs within them, without affecting the Programs themselves. And, unlike the Trinity and Triton, which could only have a single MOSS Program in any given Combi, the OASYS lets you draw upon its HD1, AL1 and CX3 engines as you choose. This is all excellent stuff, but I'm going to have a moan, nonetheless. In 1998, Novation launched the Supernova, followed in 2000 by the Supernova II, both of which offered up to seven effects per Part. When you inserted a Part into a Performance, its effects were unaffected, so a sound was identical whether used in isolation or as part of a Combi. In contrast, the OASYS sticks to the model that Korg introduced on the M1. This allows you to define a new effects structure within a Combi, or to import effects from a Program into a Combi, but only up to the Combi's limit. An OASYS Combi can support many more simultaneous effects than an M1 Combi (and with genuine multitimbrality) but it's still not always possible to preserve the sounds of the Programs within a complex Combi. What's more, you can't import Programs with their effects attached. This methodology is clunky, and it's time that companies stopped using it. As for the effects themselves, the algorithms in modern workstations are so extensive as to be unreviewable. On the OASYS, the numbers are impressive. In addition to the effects provided within the engines themselves, and in addition to 32 dedicated EQs (16 each for the synth parts and audio tracks that we'll discuss later) its dedicated effects sections offer 185 algorithms that you can insert into 12 insert effects, two master effects, and two so-called 'Total' effects, per Program/Combi. If I had to pick a handful of highlights (and I do), my list would include the Polysix Ensemble and the 'REMS' modelled microphone, amp and speaker effects. For many years, I toyed with the idea of ripping the effects board from a dead Polysix to build a dedicated ensemble unit, but the OASYS makes this unnecessary because — with four analogue inputs plus S/PDIF, all of which can be routed through the effects structure — you can use it as a sophisticated effects unit. Likewise, you can use the OASYS as a REMS processor that — channels permitting — could replace many of your stomp boxes and rackmount effects. You might think this daft, and in a studio you would probably be right, but in a live context this would reduce the number of bits and bobs on stage, and the number of cables needed to set up your rig. There are only a couple of minor niggles. The vocoder seems a bit of an afterthought. Before laying hands on the OASYS, I wondered whether it would offer something like the voice processing options on the Roland VC2 board for the VariOS and V-Synth, but it doesn't. There's also a tiny omission from the otherwise all-encompassing effects. When experimenting with the Mellotron sounds mentioned above, I tried to insert a spring reverb effect for an authentic 'Mk2' flavour, but I couldn't, because there isn't one. What is the OASYS's polyphony? It's impossible to give a one-word answer. The specification quotes maximum numbers, but the polyphony is affected by the complexity of patches, the effects used, layering, and other factors, and I doubt that you'll attain the maximum values in practice. A meter gives you an indication of how many voices are available, but my experience suggests that you shouldn't rely too heavily on this. If I cornered you in a dark alleyway and demanded that you describe Stephen Kay's Algorithmic Real-time Music Architecture, I bet that you couldn't. I don't blame you. Korg describe KARMA as a 'revolutionary performance technology that generates amazing phrases, grooves, and other musical effects that can be altered and randomised in real time', but the same description was true of the analogue sequencers of more than 30 years ago, and tells us little about why Korg make such a big deal of it. The key to understanding KARMA is this. Even if you have (for example) an amazing acoustic guitar patch or a superb harp patch, your compositions will not sound realistic if you do not play those sounds as you would the 'real' instruments. And, as we all know, it's difficult to play keyboards in the same way as guitarists play guitars, or harpists play harps. Confronted with this, Kay tried to quantify how players of non-keyboard instruments do what they do, and then describe this as a set of algorithms ('Generated Effects', or GEs) that could mimic them. I first judged his success when I tested Korg's KARMA workstation in 2001. At first, few of the KARMA algorithms excited me, but then I stumbled upon a Combi called 'Magic Flute'. If I played an interesting chord in the bottom two octaves of the keyboard, this produced a beautiful, picked acoustic guitar part, with KARMA choosing notes and inversions that sounded both believable and musically interesting. The results were not arpeggios; they were performances based upon the chords I was playing. Delving into the menus, I learned how to extend the guitars over the 61-note range of the keyboard, and to use the two 'scenes' in a GE to create a patch that picked on Scene 1 and strummed realistically on Scene 2. The Real Time Controller knobs then allowed me to manipulate parameters including the Rhythm Complexity, Strum/Pick ratio, Note Voicing, and Velocity Accents — things that human guitarists do unconsciously to suit the needs of the music. I was impressed; so much so that I bought a KARMA. But after a while I began to realise that I was always using it for the same purposes. Given that Kay had by this time extended KARMA way beyond the boundaries of imitations of acoustic instruments, creating numerous GEs for dance grooves and other musical effects, this worried me, so I tried to analyse the problem. I came up with three reasons that, in retrospect, I also believe to be the reasons that the KARMA was a less successful product than Korg might have expected. 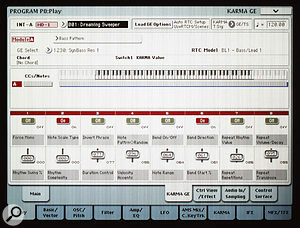 Firstly, the two-line LCD on the KARMA workstation does not lend itself to programming the KARMA GEs. 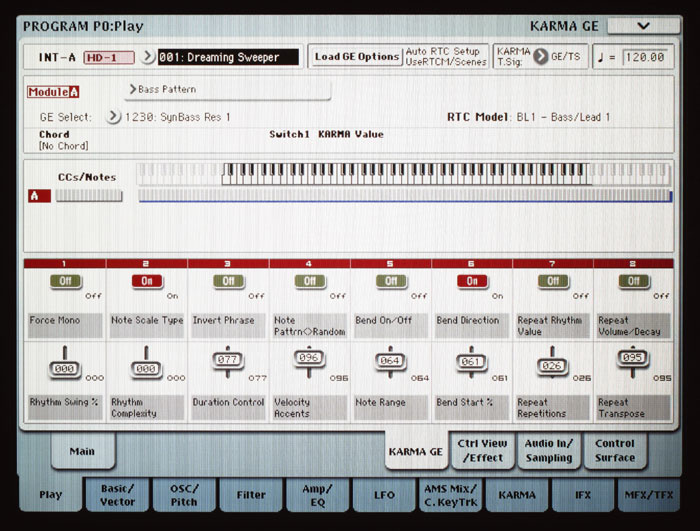 Secondly, because Korg's programmers had used KARMA to create miniature backing tracks, it was hard to view it as anything other than a sophisticated arpeggiator. This, of course, is exactly what it wasn't intended to be, because, as when playing with a human guitarist, a drummer, or whatever, you don't have precise control over the output, merely over the nature of the output. But perhaps the biggest obstacle to using KARMA was the complexity of the system. The manuals were encyclopaediaic in both length and depth, and I wonder whether anybody fully plumbed them. Now, fast-forward half a decade. KARMA in the OASYS is hugely enhanced over previous incarnations, with up to four simultaneous GEs in Combi mode. Additionally, instead of offering two scenes per Program or Combi, there are now eight per Program and 40 (!) per Combi. But despite the increase in complexity, the KARMA features on the OASYS are no harder to use than they were on the KARMA workstation. 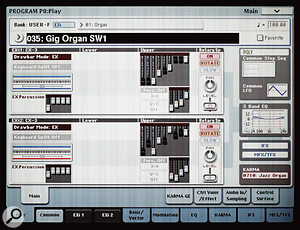 Much of this is a consequence of the OASYS's better user interface, although some credit lies in the introduction of a certain amount of standardisation that makes the GEs easier to use, in particular the separation of GEs into categories such as strumming, picking, bass patterns, and so on. To become acquainted with the new version, I took Combi A000 (which is the sound that appears when you switch on the OASYS) and experimented with the effects generated by tweaking the knobs and sliders on the control panel. I then selected the KARMA tab to reveal nine further pages of controls. Changing the GEs attached to sounds and changing the Programs in the Combi soon created something completely new, transforming the Combi from a soundtrack-y thing into something closer to 'Fanfare For The Common Man'. Further tweaking generated numerous new Combis, quite different from one another, but all sharing the same fundamental structure. Given that I was relying upon serendipity to create something interesting, the results were more than acceptable. If you're a composer working in strict tempo, KARMA can be a fascinating tool for obtaining inspiration and for capturing ideas quickly and simply. But even if you don't want to delve into the programming system, you might find inspiration from the existing GEs and KARMA-processed Combis, using OASYS as a toolkit of musical expressions, or even as a big auto-accompaniment keyboard. The OASYS has a wealth of I/O, including no fewer than eight individual analogue audio outs in addition to a L/R stereo pair. Alongside these, you'll find a headphone socket and four analogue inputs, two of which offer balanced and unbalanced options with mic/line options, level controls, and 48V phantom powering. Digital I/O is also provided, with 24-bit optical S/PDIF input and output. Given the flexibility of audio assignment within the OASYS, it's fair to say that it's well provided with ins and outs. Control options are par for the course, with MIDI In, Out, and Thru sockets, and three control pedal inputs (for a damper pedal, a switch, and a single continuous pedal). Finally, there are four USB2 sockets that you should be able to use for external storage. I was unsuccessful using a 128MB memory stick, but I'm not going to hold that against OASYS version 1. There is a single I/O expansion option. The EXB-DI board will provide an eight-channel ADAT output that mirrors the individual analogue outputs or the stereo pair (as you choose), and also offers a word clock input. This will allow you to synchronise the OASYS's sample rate to external devices, but is not a substitute for a timecode input. I've left two aspects of voice creation to last: wave sequencing and vector synthesis. Like a drum setup, you create wave sequences in the Global area of the OASYS, and apply them by selecting 'Wave Sequence' rather than 'Multi Sample' in the HD1 oscillators. Given that you can velocity-switch up to four such sequences and layer any two when building HD1 sounds, this provides great scope for creating evolving sounds or injecting rhythmic interest. The wave-sequencing specification is more advanced than that of the Wavestation family, but anybody familiar with these synths will be comfortable with the OASYS's implementation. Hmm... I should have said that they'll be comfortable with a subset of the OASYS's implementation, because KARMA now includes wave sequencing, too. Just as you can ask GEs to play notes, affect velocities, and so on, you can now attach waves to KARMA steps, thus making it an amorphous wave sequencer as well as an amorphous pattern sequencer. This is appealing because, unlike a pre-defined sequence, there is a degree of uncertainty about the result, which adds further interest to the sound. You shouldn't confuse this with conventional wave sequencing, because you can't hold a note and create evolving sounds that crossfade between waves. However, there are many other possibilities, so the creative potential is immense, particularly when creating rhythms. And you can access and program all of this far more simply than on the original Wavestations. Similarly, anyone who programmed vector synthesis patches on a Prophet VS, Yamaha SY35 or Korg Wavestation will grasp the Advanced Vector Synthesis on the OASYS. The difference here is that AVS is not limited to the PCM-synthesis engine; you can use it to control the balance between EXi1 and EXi2 in a single Program, as well as to control the balance of the oscillators in an AL1 patch. This opens up no end of morphing possibilities. Likewise, you can morph the contributions of Programs within Combis, and modulate effects settings, both of which offer much creative potential if you're working in a surround environment. As always, you can apply vector synthesis using the joystick, or in a repeatable fashion using the five-point vector envelope. The big improvement here is that you can now modify the envelope using modulation sources, and synchronise it to MIDI tempo. 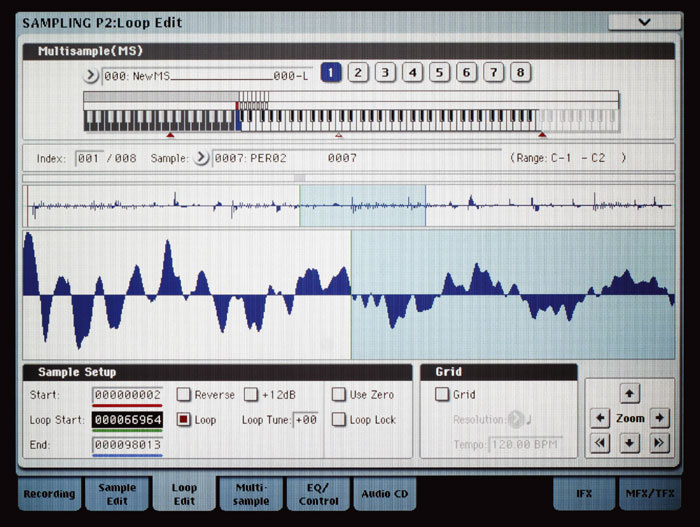 And the vector envelope can itself be used as a MIDI CC. It's all good stuff. I have never much liked the sequencers built into keyboard workstations. There's only so much one can do with limited processing power, limited RAM, and an operating environment reminiscent of attempting to paint the roof of the Sistine Chapel through a letterbox. Consequently, I had high hopes for the OASYS's sequencer. With a PC under the bonnet and a 640x480 pixel screen, it should have been possible for Korg to endow the OASYS with the most remarkable sequencer yet seen on a keyboard. 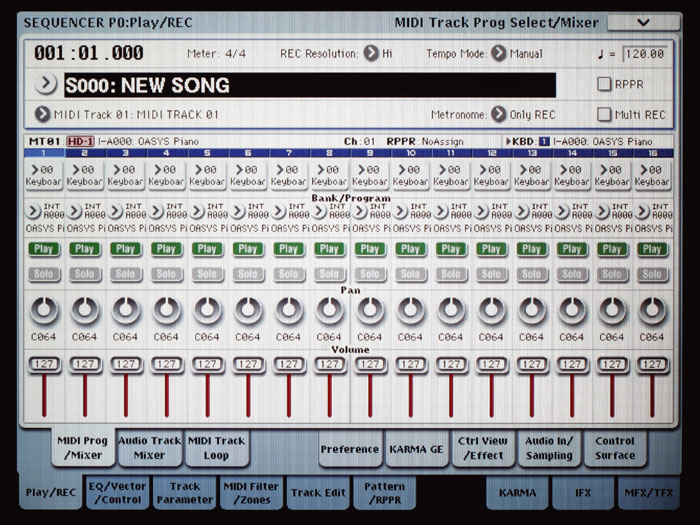 Surprisingly, it's little different from the sequencer in the Triton Studio (see above). It's solid and reliable, and everything falls to hand more easily than before, so you could view this as a case of not fixing what isn't, well, broke. There has been progress, with a handful of extras such as in-track sampling and Song Templates but, ultimately, I feel that this is a missed opportunity to lift the workstation aspect of the OASYS to a completely new level. It's important that I put this concern in context. Some people have suggested that the OASYS should have a sequencer with the power of Digital Performer, Cubase or Logic, but this is irrational. Companies dedicated to these packages have refined them over two decades, and it's unreasonable to expect Korg to have emulated them in the first version of the OASYS. In addition, the user interfaces of Mac- and PC-based packages offer drag and drop functionality and the ability to draw things on screen, two operations that you can't perform on the existing OASYS. Photo: Richard EcclestoneSo... it's currently impossible for Korg to have stepped far beyond the style of sequencer that they've been offering since 1988. But understanding this and feeling comfortable with the limitations are different things. 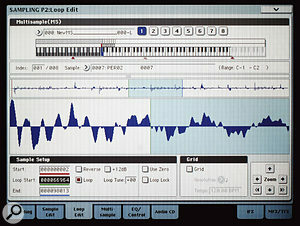 Text-based event editing is archaic, and the OASYS begs for a better sequencer that offers piano-roll representations and graphical editing of notes and CCs. Happily, I understand that these are also on one of Korg's upgrade lists. If the OASYS's sequencer is currently a slight disappointment, the same cannot immediately be said of this workstation's ability to handle audio; its ability to record up to four tracks simultaneously and play back up to 16 makes it stand apart from the crowd. 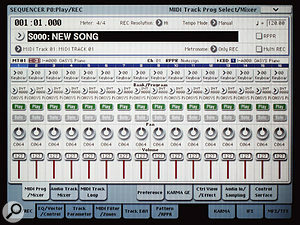 The OASYS is not Pro Tools HD, but, with its ability to tap its effects, its (albeit limited amount of) automation and audio-event editing, and its use of the top panel as a tactile mixer, it is perhaps the first keyboard to embrace fully the concepts of a digital audio workstation, or DAW. You might ask why manufacturers bother integrating recorders into their workstations. After all, anyone able to afford an OASYS will almost certainly own a computer running a MIDI + Audio package of one flavour or another. I suppose you could argue that, if you're going to stick a 40GB hard drive inside a keyboard, you may as well use it for recording, especially if the instrument already has audio inputs. But to be so dismissive is to miss the point. When a recorder is incorporated into a workstation, the boundaries between sampling and recording can become blurred in a way that is not necessarily true of dedicated DAWs. The OASYS allows you to manipulate audio fluidly, cutting and pasting it freely in audio or MIDI-based sequences, using it as the basis of conventional sampling, or even resampling it to free up audio tracks, polyphony and effects for further sounds and sequencing. This means that if Korg's developers are indeed working on updates and revisions in this area, as I have been told they are, the OASYS could have had the potential to approach the ideal of an all-in-one production tool for video post, foley and TV. Unfortunately, it has a single deficiency that makes this ideal unobtainable. It has no timecode capabilities. Damn! Mind you, other limitations stop the OASYS performing exactly like a computer-based DAW. 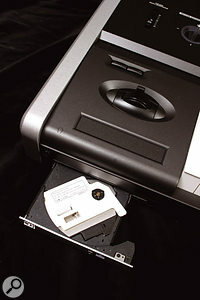 For example, you can only record to the internal drive. Furthermore, with the OASYS, Korg have built another workstation with a 48kHz internal synth engine, which incorporates S/PDIF inputs and outputs that support only 48kHz and 96kHz sample rates, and they have, naturally, provided it with a CD burner that writes audio CDs at 44.1kHz. This means that everything you play, record or sample has to pass through an internal sample-rate converter as it's burned to disk. Thus any tiny improvements in audio quality gained by using 48kHz instead of 44.1kHz are lost when converting downwards. So maybe the greatest beneficiaries of the OASYS's recorder will be 'live' performers. The 16 tracks and 80 minutes of track recording time will allow many artists to leave their laptops at home, which has got to be a good thing for simplicity and reliability on stage. Last month, I suggested that it was possible to take the single-oscillator three-layer EXs1 piano, and add a fourth layer and the piano damper sound to create a dual-oscillator Program similar to the far greedier EXs2 piano. It seems that Korg's programmers had the same thought, because when you upgrade to v1.0.2, this is exactly what you get! For reasons of space, I've had to omit much about the OASYS that I would have liked to have discussed: things such as the control assignments, the use of the touch-pads, the drum kits, and some of the factory sounds. Nevertheless, I hope that I've been able to convey that — while it will benefit from further development in some areas — the OASYS is already a superb synthesizer that sounds fantastic. In many ways, I applaud Korg's decision to make the OASYS sound good first. However, it's important that the developers don't design new synthesis engines to the exclusion of bringing the workstation aspects up to speed. While they're usable as they are, the sequencer and the hard disk recorder require further development if the OASYS is to fulfil its potential. It's also important for Korg to start bringing the first upgrades to the market quickly, although I understand that the developers are working flat-out in all areas of the OASYS's operating system, so hopefully the first large upgrades won't be long now. Finished mixes can be burnt to CD using the built-in CD writer.Photo: Richard EcclestoneIf I were asked what synth engines Korg should add first, I would offer two suggestions. 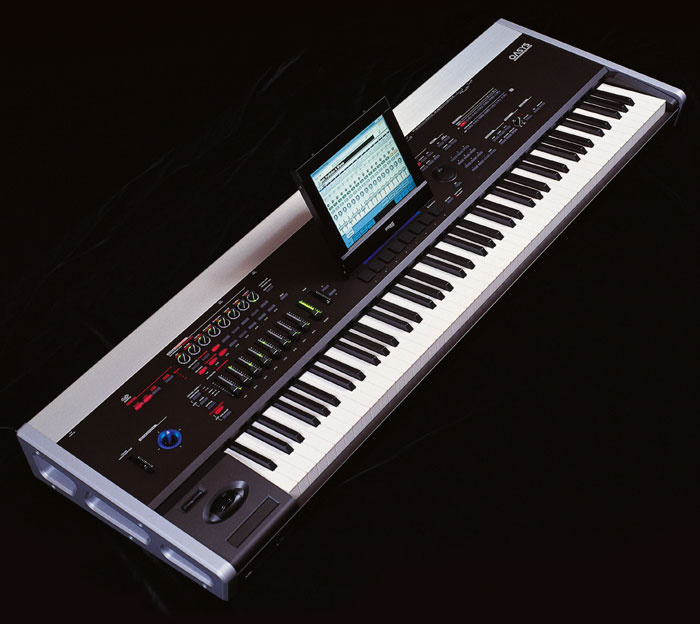 Given that the OASYS already offers two modelled instruments, it would seem reasonable to suppose that Korg could develop SAS-style pianos and electric pianos for it. Certainly, the motherboard could handle it; Roland's RD1000 had the CPU power of a dishwasher, yet is still used by aficionados for whom nothing has ever superseded it. Likewise, there should be nothing stopping Korg from rewriting the physical models from the Z1 and incorporating them in the OASYS. The Z1 was a fantastic synth, misunderstood and undervalued by keyboard players the world over, and it deserves another chance, particularly on an instrument with a user interface like that of the OASYS. In addition to these, I would like it to be possible to play a CD and the keyboard simultaneously. I spend a fair amount of time learning other people's material from CD, and it would be helpful to be able to do so without requiring an external CD player or having to rip the CD into the OASYS first. Moving on to the physical lump that is the OASYS hardware, you should consider which size of OASYS is most suitable for the type of music you play. Fortunately, both keyboards are pleasant and responsive, so the compromises entailed in choosing one over the other are not as great as they could be. In fact, apart from the hinge on the display, which I mentioned last month, there's only one other part of the OASYS's physical being that concerns me, and that's the CD drive (shown left); the tray feels flimsy, and I would have preferred something more robust. Better still, why not adopt the tray-less design used in my G4 Powerbook? This would seem much more suitable for a flagship instrument, both on the road and in the studio. Despite the technological progress of the past 10 years, the OASYS (Synthesis Studio) is very similar in concept to the original OASYS (Synthesis System). If this sounds like a criticism, it's not. 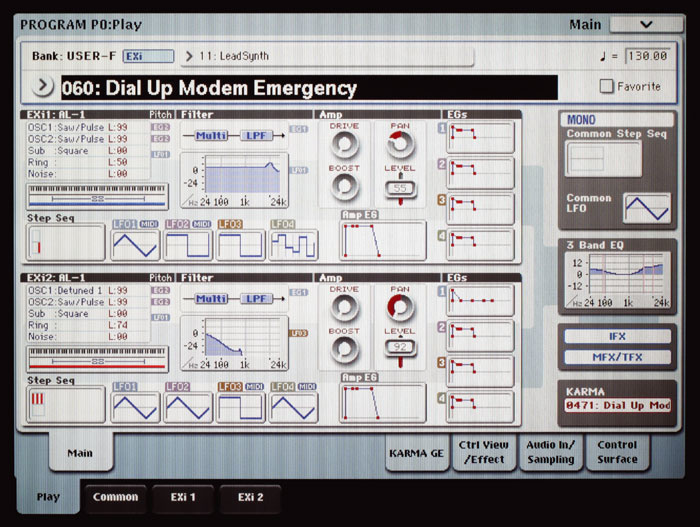 In fact, it demonstrates that Korg were way ahead of the game in 1995. Sure, the hardware of the mid-'90s was unable to support the company's vision, but the technology of 2005 demonstrates clearly that the vision was a good one. So, who's going to buy an OASYS? Given the substantial price tag, it's clear that the OASYS was not aimed at the hobbyist or the local band. 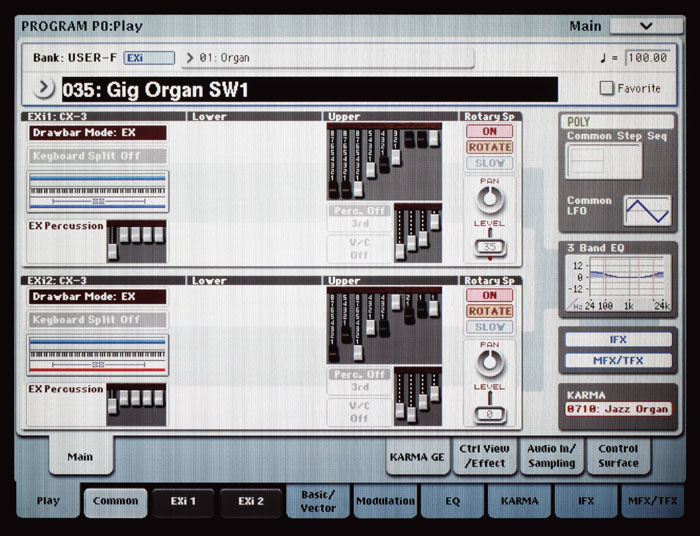 This is a flagship instrument aimed at composers, serious players, and major studios. Nevertheless, it's already finding favour with keyboard enthusiasts. Like a 50-inch plasma television, it's something that you can do without, but which — if you have the cash — will do what it does better than anything else. The OASYS's existing voicing is superb (with more to come) and, while the sequencing and hard disk recording facilities are not yet in the same class, they are due to improve considerably. More importantly, the integration works faultlessly, which means that there's no way you should compare the OASYS to a PC plus a controller keyboard and a bunch of software packages. Most important of all, I can overlook my criticisms of the OASYS because I love working with it. Everything falls to hand effortlessly, and if you view a synthesizer as a musical instrument rather than a mere bundle of technology, the OASYS is currently in a class of its own. Other manufacturers are going to have to respond to compete, and that — whether you buy an OASYS or not — is going to benefit all of us. Given that I also expect to see spin-offs over the next few years, I can only conclude with one sentiment: Bravo Korg! There's so much here, you'll be learning about it for years. It's not cheap (but see the 'Value For Money?' box). The OASYS sets a new standard for keyboard workstations. If you're a keyboard player, you'll want an OASYS. If you're another keyboard, you'll aspire to be an OASYS. If you can afford one, I bet you buy one. OASYS88, £5399; OASYS76, £5149. Prices include VAT.